Lenovo has introduced new Android tablet, Lenovo Yoga A12 at a starting point of $299. A12 is a smaller variant of Lenovo Yoga book running on Android. The A12 features a Halo keyboard as the Yoga Book. Lenovo A12 offers a 12.2-inch screen with an Intel Atom x5 processor, 2GB of RAM, and 32GB of storage, and runs a similar version of Android with a three-column multi-window mode for multitasking. And of course, as a member of the Yoga family of devices, it features a 360-degree hinge to convert the A12 to a tablet form-factor. 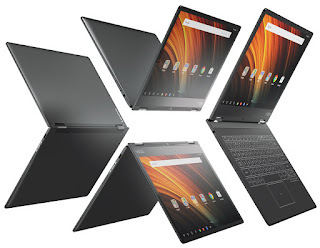 The Yoga A12 will be available on Lenovo’s website on February 8th in either Gunmetal Grey or Rose Gold colors, starting at $299 for the base model.